One of the most important tools for a pup is his collar. Puppy collars represent the transition from being a stray pup to a human pup who is owned, loved and cared for. When I first started research into pup play the first lessons were about the three most important items of pup play gear. Your collar, your puppy tail and your puppy hood. From a psychological perspective the collar represent the bond between master and pup. In some pup packs the collaring of a puppy is a special ceremony, a welcoming of a new pup into the pack. Your first puppy collar represents you being brought in from the cold, no longer a stray. You’re a pup, an owned pup. You are loved and cared for, not a stray any more. Every pup must have a collar, and every collar is different to suit the personality of the pup. For an great selection of puppy collars I recommend you check out Mr S. Leather, neoprene, rubber, steel. There is a collar for every pup, and every pup must have a collar. Check out Mr S’s awesome range of puppy collars here. 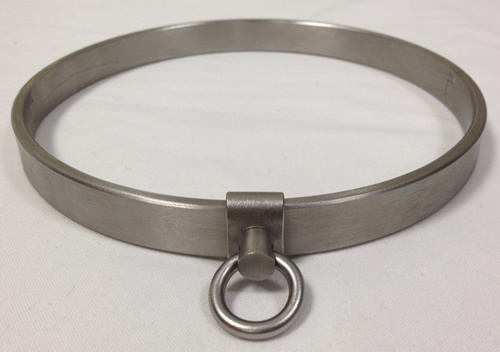 Have you seen this beautiful locking stainless steel talon collar? This collar is beautiful, comfortable and best of all it can be worn 24/7 allowing you to feel owned all day every day. Just added to my puppy collar collection is this beautiful hand crafted stainless steel chainmail collar made in the heart of pup play central, San Francisco. If you are looking for a collar that is comfortable, beautiful and able to be worn 24/7 this is the collar for you. Beautiful Chainmail Collar For Your Pup.